Attendees are expected to reach the venue well in time before the scheduled time of the event. For paid events, the fee includes Rs 300, that you can redeem for F&B at any Doolally Taproom in Mumbai. You will receive it as a code in an email from us, along with your booking confirmation details. However, if you are using a discount coupon code, your fee will not include F&B. For free events, we don't levy a cover charge. You can place an F&B order and settle your bill at the end of the event. You will also be given access to a dashboard. This is where you can contact the organisers or us for more details. You can also cancel your attendance here. Doolally will bear the 2.24% payment gateway fees except during cancellations by either the organiser or attendee. If you need to cancel your attendance to an event, you can, we will refund your money. However, the payment gateway transaction fee of 2.24% will be borne by you. If an organiser cancels the event, we will refund the full amount to you. In case you are unable to attend the workshop, and haven't managed to cancel your attendance 2 hours before the workshop, you will be considered as a No Show. In this case, 50% of the workshop amount would be refunded to you (the attendee) after deducting transaction fees of 2.2.4%-5% 50% will be paid to the organiser, as reimbursement for materials & equipment that you would have purchased for the attendee. 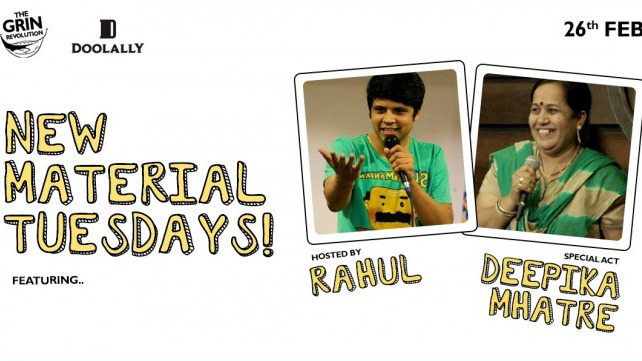 Share "New Material Tuesdays w/ Rahul Subramanian"